Savanna Groft, a third grader at the time, was assigned a project at school. Her teacher asked her to crochet a round placemat as part of her handwork studies. Savanna’s initial efforts yielded a round disk, but because she had not added enough stitches, the disc curled under forming a small lip. This placemat of sorts sat on a table for over a year until a family friend, Chris Larsen, came over, and threw it. The placemat sailed across the living room and the Pocket Disc was born. 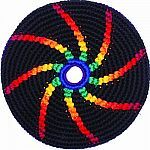 Pocket Disc was formed with the intention of making more flying discs. Because co-founders Chris Larsen and Patrick Groft wanted not only to make Pocket Discs but also to make a difference, they searched for a fair trade women’s cooperative to begin production of the discs. They found what they were looking for in the impoverished country of Guatemala. 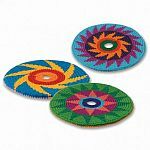 The Mayas of Guatemala have been weaving and crocheting bright patterns for centuries and bring a deep cultural talent for handwork to the Pocket Discs. Each village specializes in a few patterns. The patterns of a village are passed down with the generations. In return for the amazing artistry that these women add to the Pocket Disc, the women are paid fairly and work under good conditions. Phd Productions is a member of the Fair Trade Federation and follows the Federation’s guidelines to ensure proper treatment of its workers. The money they make crocheting Pocket Discs and other hand-made products enables their children to go to school and helps keeps them out of poverty in a country in which 56% of people now live below the poverty level. The village of San Pablo, where many of our artisans live, has one of the highest rates of malnutrition in Guatemala, which as a country has the second highest rate of malnutrition in the western hemisphere, after Haiti. If you are looking for an indoor Fun choose the Indoor Pocket Disc. It is our smallest and lightest model designed to not knock things over. Check out our Indoor Disc Games and Uses such as Indoor Disc Golf, Pocket Disc Bowling, and Ceiling Fan 500. The possibilities are endless even when you can't go outside. If you are looking for Outdoor Fun choose the Sports Pocket Disc. It is substantially heavier and a little larger so that it flies straight even on windy days. In fact, this Disc regularly flies as far as 50 yards, which is about 20 yards farther than the Indoor Edition. Don't believe us? Try it. Outdoor Discs are colorfast and great for the pool.